cool-climate chardonnay. Its name on a wine label commands immediate respect. The river itself streams down from Mendocino through the heart of the valley, flowing into the Pacific Ocean north of Bodega Bay. The valley vineyards appear as islands as the road emerges from the thick pine and redwood forest. 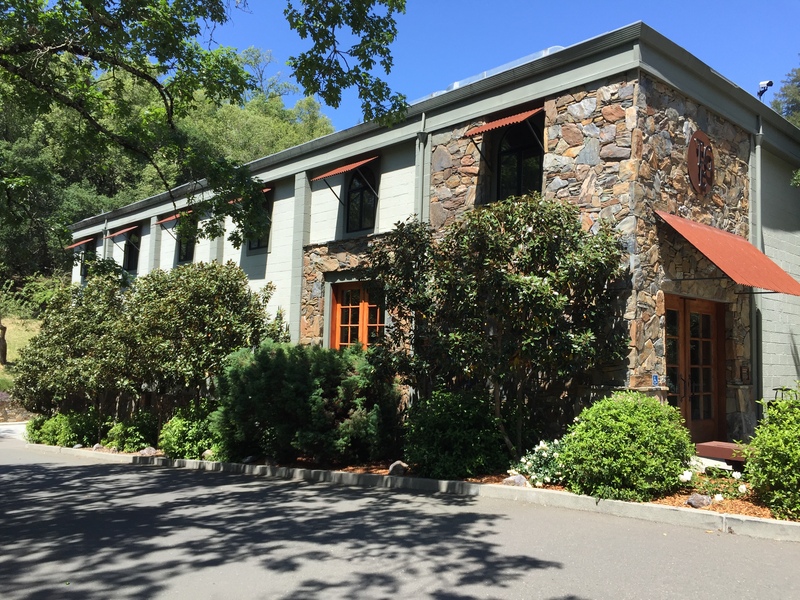 The Westside Road is a beautiful, scenic thoroughfare connecting Healdsburg with River Road and the Guerneville area and home to some of the appellations finest winemakers. Today, we are visiting a patriarch among California producers of Burgundian wines and a fairly new operation on a renovated, historic site, both offering fine wine and unique tasting opportunities along Westside Road. Simply stated, Williams Selyem produces some of the best wine California has to offer. Admittedly a customer for several years, I find all of their releases to be balanced, complex with layered, lingering flavors. 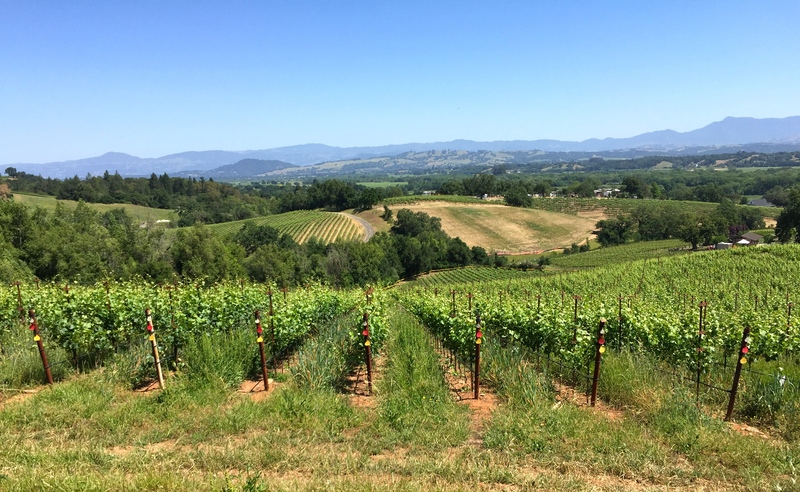 Opposed to some of the luscious “fruit bombs” from the Valley, Williams Selyem wines are more austere, medium-bodied, with flavors and texture than appeals to palates of all levels. 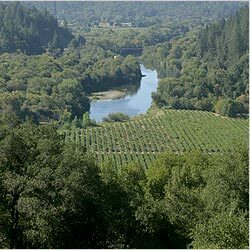 build a reputation for the Russian River Valley as a premier wine region. 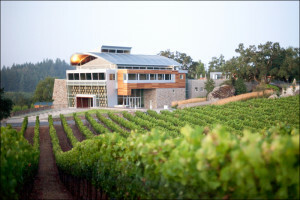 Burt and Ed sold the winery to John Dyson in the late 1990s who later relocated it to the Westside Road property, establishing the first estate vineyards and completing a new sate-of-the-art winery in 2010. Weathering a change of ownership, head winemaker and location, Williams Selyem has more interest in their wine than they can handle and still produce world-class pinot noir, chardonnay and zinfandel sourced from our finest vineyards. I have been a patron of Williams Selyem for more than a decade and did not know that they produced a 100% chenin blanc wine, a Loire Valley grape that has made somewhat of an international comeback in recent years in South Africa and other regions. Available only at the winery, the 2012 Williams Selyem Chenin Blanc Vista Verde Vineyard ($30), sourced from a San Benito County vineyard. As one would expect, they have succeeded in balancing the tartness of this varietal by pushing the fruit flavors forward. I recommend this wine as a vibrant, crisp summer wine, but it is only available to those willing to explore the depths of Westside Road, past the one-way bridge to Williams Selyem. Your reward is a lovely property with impressive tasting room, tour program and space for a nice picnic. 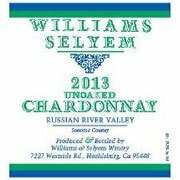 One of the spring releases that I was picking up was the 2013 Williams Selyem “Unoaked” Chardonnay Russian River Valley ($39), fermented in stainless steel, once again balancing a crisp acidity with full texture and mouth feel. This exceptional wine can be perfectly paired with sushi, crab, river trout or enjoyed al fresco. 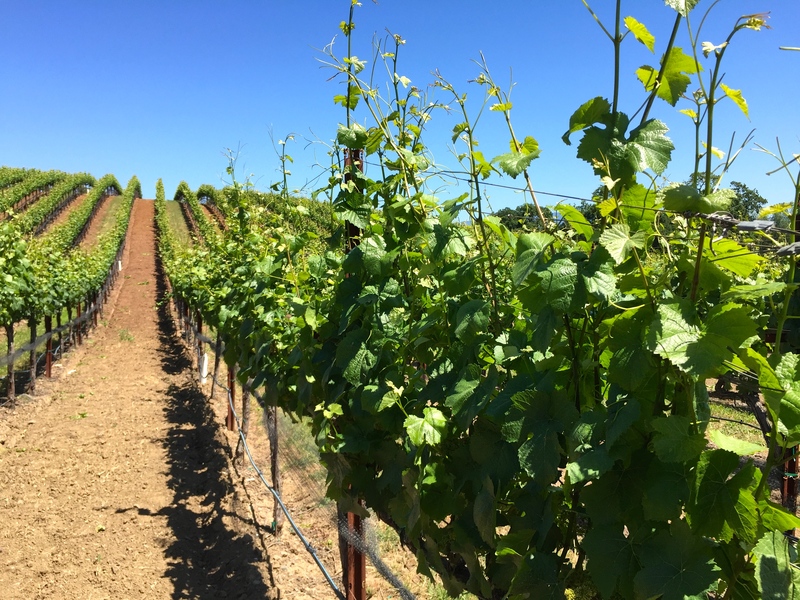 Williams Selyem has received acclaim for single-vineyard chardonnay sources from the Allen, Drake and Heintz Vineyards, all rated in the mid to high 90-point range. I prefer the Heintz Vineyard located in Occidental, CA, family owned for over 100 years with an abundance of dirt called Goldridge Sandy Loam. Two more tasting room exclusives, both estate pinot noir, were the next pours. The initial vintage 2012 Williams Selyem Pinot Noir “Luella’s Garden,” named after previous property owner Leulla Litton, who kept a garden where the vineyard now stands, was very fruit-forward with rich concentrated cherry and spice flavors. Unlike the single clone “Leulla’s Garden,” the 2012 Williams Selyem Block 10 Mass Selection Estate Vineyard Pinot Noir is planted to 18 different Pinot Noir clones and is reminiscent of the Burgundy-style wines, medium-bodied with layered flavors and a pleasant minerality. Williams Selyem produce an array of single-vineyard pinot noir releases from esteemed vineyards like Bucher, Ferrington and Allen. Past vintages, the 2008 Hirsch Vineyard Pinot Noir and the 2009 Precious Mountain Pinot Noir both received near perfect 99-point ratings from wine Enthusiast magazine. notable. The 2013 Williams Selyem Central Coast Pinot Noir ($39) is sourced from the Vista Verde Vineyard in San Benito County, near the small town of Tres Pinos where the soil is heavily laden with limestone. The result is usually an earthy wine with beautiful bouquet, firm tannins and full floral and spice flavors. Noir ($52), sourced from the Hirsch and Estate Drake Vineyards, is often their most complex with flavors of cherries, cranberry, orange, vanilla and even chocolate among others. appellation designation. The Baker Family, dad Thomas and son Jeremy purchased the Bynum Winery and assembled three estate vineyards with fully intention to carry on a tradition of fine wines from the property. steel, concrete is porous and permeable to water and can impact the flavors of the wine. and minerality that was balanced by the full-bodied tropical flavors. 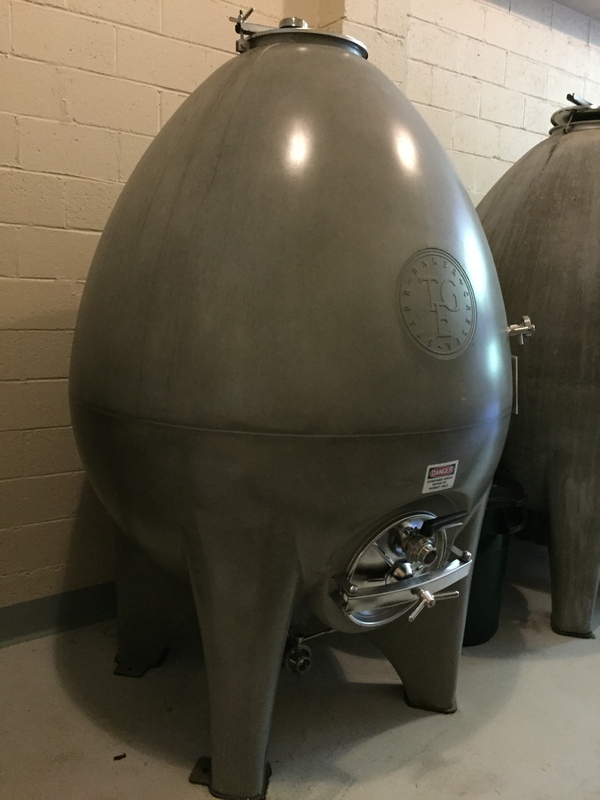 The larger production 2011 Thomas George Estate Russian River Valley Chardonnay ($34), comes from 70% oak barrels and 30% concrete eggs with some malolactic fermentation giving it a nice rich mouthfeel with tropical and stone fruit flavors. Next we tasted a flight of three pinot noir from different blocks within the Baker Ridge Vineyard, each from a unique micro-climate. East-facing for ample morning sun, the 2011 Thomas George Baker Ridge Backbone Block Pinot Noir ($75)comes from a cooler, protected slope, producing less than 100 cases of a deeply rich wine with a complex, floral nose and dark fruit flavors. A lovely wine that will become exceptional with age. From a south-facing slope that receives sun until 7 pm during the peak growing season, the 2011 Thomas George Baker Ridge Dexter’s Block Pinot Noir ($75) exhibited intense floral aromas and a rich, concentrated and complex flavor profile. 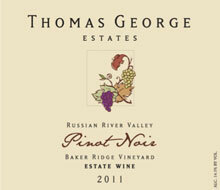 The 2011 Thomas George Baker Ridge Russian River Valley Pinot Noir ($70) originating from multiple cloned vines planted decades ago by Davis Bynum, exudes floral aromas and dark berries and spice on the palate. We finished the pinots with the 2012 Thomas George “Barrel Selection” Pinot Noir ($50) and the 2012 Thomas George Cresta Ridge Vineyard Pinot Noir ($60), the later as full-bodied as any tasted. Our tasting concluded with a delightful grenache sourced from local vineyard management icon, Ulises Valdez’s El Diablo Vineyard. The 2011 Thomas George Grenache El Diablo Vineyard was very fruit forward with a satisfying finish that lingered. Valdez, an immigrant and self-made man, farms and manages over 800 acres of vineyards, mostly in the Russian River Valley including all the Thomas George estates. outdoor weddings, special events await wine club members and those looking for a unique wine experience in the heart of the Russian River Valley. Wine club members also enjoyed reduced rates on the four upscale guest houses on the site. This entry was posted on Thursday, May 14th, 2015 at 7:02 am	and tagged with Pinot Noir, russian river valley, Thomas George, WILLIAMS SELYEM and posted in Uncategorized, Wine. You can follow any responses to this entry through the RSS 2.0 feed.